In Oregon, lenders may foreclose on deeds of trusts or mortgages in default using either a judicial or non-judicial foreclosure process. In this type of foreclosure, the borrower may redeem the property by paying the purchase price, with interest, the foreclosure costs and the purchaser's expenses in operating and maintaining the property within 180 days after the date of sale. The borrower must file a notice no less than two (2) days and not more than thirty (30) with the sheriff to redeem. A notice of default must be recorded in the county where the property is located and the borrower and/or occupant of the property must be served with a copy of the notice at least 120 days before the scheduled foreclosure sale date. A copy of the notice must be published once a week for four (4) successive weeks, with the last notice being published at least twenty (20) days prior to the foreclosure sale. Said notice must contain a property description, recording information on the trust deed, a description of the default, the sum owing on the loan, the lender's election to sell and the date, time and place of sale. The borrower may cure the default at any time prior to foreclosure by paying all past due amounts, plus costs. The sale must be at auction to the highest bidder for cash. Any person, except the trustee, may bid at the sale, which take place between 9:00 am and 4:00 pm at the location stated in the notice of record. The sale may be postponed for up to 180 days from the original sale date if at least twenty (20) days advance notice is given, by mail, to the original recipients of the notice. A deficiency judgment cannot be obtained through a non-judicial foreclosure, but may be pursued when other foreclosure methods are used. 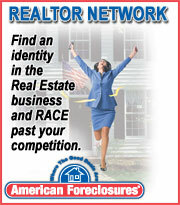 Copyright 2009 American Foreclosures, Inc. All Rights Reserved.